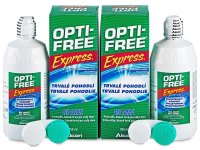 Opti-Free Express contact lens solution is a highly-efficient, universal solution. It helps lenses retain moisture for up to 24 hours. Opti-Free Express is suitable for disinfecting and cleaning, and this package contains two 355 ml bottles. Opti-Free Express is a highly efficient, universal solution produced by Alcon. One of its active ingredients, poloxamine, provides exceptional moisture to the surface of contacts for enhanced comfort. It helps retain moisture for up to 24 hours. 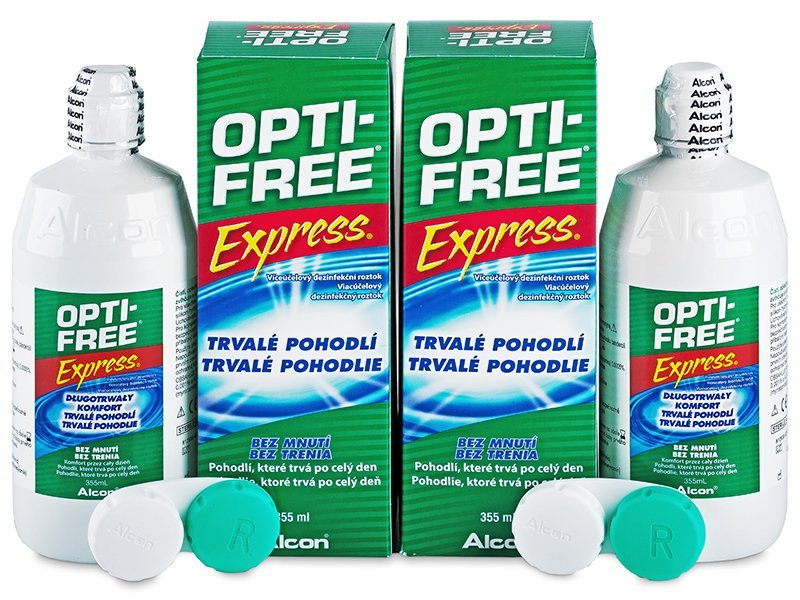 Opti-Free Express is suitable for disinfecting, cleaning, rinsing, moisturising, and storing all types of contact lenses. This package contains two 355 ml bottles of solution and two contact lens cases. We also sell this contact lens solution in different sized packages, including 120 ml, 355 ml, and 3 x 355 ml. „NO RUB“ means you do not need to rub your lenses in solution between your palm and finger after removal. However, experience and research indicates rubbing improves the efficiency of the solution and its effect on contact lenses. As a result, although Opti-Free Express solution is labelled as "no rub“, we recommend rubbing your lenses gently between fingers for better removal of protein deposits before putting them in a case for storage. Opti-Free Express contact lens solution should be used within six months of first opening.